Iceland absolutely blew up in 2016 and become one of the most sought after tourist destinations around the world, and for good reason. With the combination of stunning Iceland photographs going viral and every blogger on planet Earth tweeting and instagraming photos of this amazing country, you've no doubt seen your fair share of Iceland in your newsfeed recently. We were thrilled to visit Iceland, but were skeptical it would hold up to all the hype we'd seen about it. While we have dreamed of seeing the Northern Lights for years, we decided to first visit Iceland in June, when the small island would have 24 hours of full sunlight. Landing at the airport 45 minutes from Reykjavik, we started getting giddy as soon as we saw the coastline. The jagged rocks, stark green grasses against the black sand beaches, the bright purple flowers dotting the landscape in every direction. We had truly arrived in Narnia, Wonderland and Winterfell. As soon as we hit the road and started driving into the city we couldn't stop not only laughing and pointing in every direction at the sheer beauty but stopping to take photos every five minutes thinking we were seeing a sight that would only happen once. Little did we know, the next 4 days would be driving and stopping every five minutes just the same. "Iceland will forever be our escape, a place we can go if we forget what it means to be human, forget the beauty in the world or forget what it feels like to be inspired." After spending three days exploring Iceland in June, wandering the adorable little streets of Reykjavik, taking a boat out to see the puffins, enjoying Einstok, the best local beer we've ever had, and driving out around the Snaeflesness Peninsula through ancient lava fields, climbing up gigantic waterfalls, descending into amazing lava caves and even trying fermented Greenland shark. Check out our complete 48 Hours in Iceland article for all the details of our amazing summer adventure. We've got all the details of the route we took, the places we went, our tips for saving money, maximizing time and making the most of what will surely be the most memorable roadtrip of your life! The best tip we can give here is to rent a car direct from the airport and just go get lost. In any direction you go, you will find incredible sights that will, I promise, blow your mind. Head up north like we did to Snaefellsness, or go directly inland and explore Thingvellir National Park. If you head south, you've got just as much adventure with the Black Sand Beach, Vik (Iceland's southern most town), and glaciers and waterfalls so stunning you'll think you're in a postcard. Now, the summer was incredible because of the non-stop sunlight. We literally got up at 5am every day, ate a hardy breakfast and drove all day, sometimes not stopping until well after midnight, as the light just never quits. Our summer adventure was so incredible that we immediately planned a trip back in December to see what this magical island had in store during the winter months - afterall, Lonely Planet named Iceland its best European hotspot in 2015. Arriving a couple days before Christmas, Iceland is just as stunning covered in snow and ice as it is rain and greenery. The excitement that we felt seeing our favorite destination of 2016 turned into an equally magnificent winter wonderland was palpable. Now, if those Northern Lights would just cooperate with us. Again, we rented a car and planned to spend most of the days out exploring. As we'd only driven north our first time to Iceland, we spent much of our winter adventure exploring inland towards Golfoss, Geysir and Thingvellir as well as down along the south coast, which left us with truly endless adventures. We could dive between tectonic plates, explore vast black snad beaches or even take a Jokulsarlon ice cave tour, inside the larger glacier in Europe. Now, the main challenge was maximizing the winter sunlight, which usually lasted from around 11am-3:30pm - making every day a race against the clock. We were packed and ready to go just as the first light came out each morning and spent our days exploring until the last lights left the sky. Within a few minutes a long, milky banner appeared overhead and shortly exploded into the most incredible Northern Lights display we could have imagined. We were speechless, in awe and totally blown away by the subtle beauty that this incredible natural phenomenon had provided us with. It looked as though green and yellow curtains were softly blowing above the planet, something surely to take anyone's breath away. What we learned in 2016 is that not only is Iceland our favorite country in the summer, but the winter is just as magical, making it our all out, year round, favorite place to explore, but it doesn't just stop at the nature. And the best part? The world famous Blue Lagoon is open year round, rain or shine, and no matter the conditions, it will be a once in a lifetime experience and absolutely not to be missed if you make it to our favorite country on Earth. Iceland has a feeling to it that we have not found anywhere else on Earth. Sure, we love SE Asia, Africa, our home countries and exploring the Middle East. 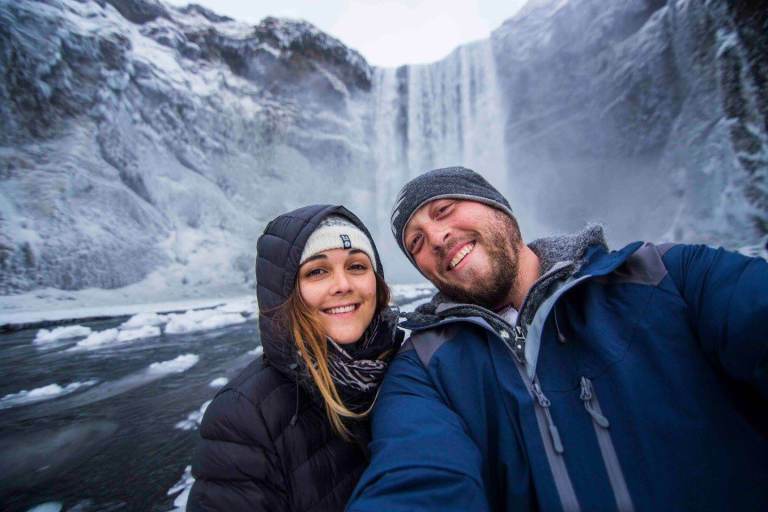 We love going on adventures to new places and discovering parts of the world that we never knew existed, but nowhere has ever felt quite like Iceland. Iceland feels free. Iceland feels natural. And Iceland feels magical. Iceland will forever be our escape, a place we can go if we forget what it means to be human, forget the beauty in the world or forget what it feels like to be inspired - which easily makes it our favorite country on Earth.